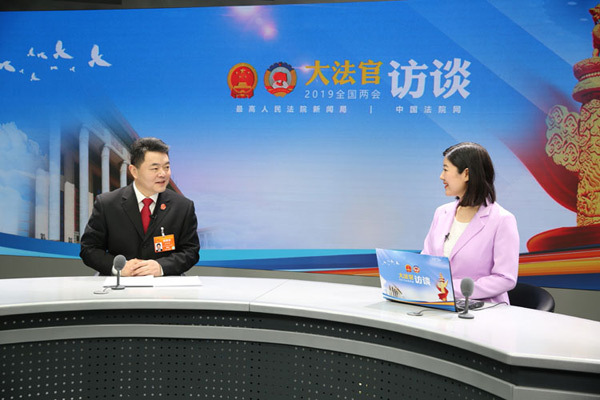 Jilin Higher People's Court President Xu Jiaxin, communicated with online users on "Justices' Talks", a program hosted by the information bureau of the Supreme People's Court (SPC) and chinacourt.org during the national two sessions on March 12. He shared his views on "securing a decisive victory of 'substantially solving the difficulties in enforcement'" on the program. In 2016, the SPC proposed the goal“substantially solving the difficulties in enforcement within two to three years". Xu said that after three years' efforts by the court-wide police officers across the country, the province's higher people's court has completed the goal of "substantially solving the difficulties in enforcement" task, presenting an "excellent answer sheet" to the people. According to Xu, over the past three years, among the Jilin courts' cases involving first enforcement, 245,000 were filed, 224, 000 were closed, the closure rate reached 91.55 percent, and the sum of money being enforced in place was 83.4 billion yuan ($12.42 billion). Frozen internet deposits were 9.716 billion yuan, the network deductions were 566 million yuan, and frozen securities were 1.6381 million stocks. All courts in the province have achieved the core requirements on enforcement set by the SPC. Xu went on to say that, since the beginning of 2016, Jilin's Higher People's Court had organized the courts across the province to pull over the over-stock historic enforcement cases formed before the end of 2015, keep a record for each case, and make a detailed plan for the goal. In that way, 99.73 percent of 85, 241 over-stock historic enforcement cases had been solved. "The SPC printed documents to promote the enforcement methods of our province across the country", Xu said with pride. When answering the netizens' question on whether the enforcement work will return to the old status after the two to three years' efforts, Xu said that it is necessary to build a long-term mechanism. On the one hand, relevant laws should be established, such as making coercive enforcement laws, and research on building personal bankrupcy regulations; on the other hand, it is essential to normalize and institutionalize the good methods formed in practice. These are the keys to consolidate the achievements, ensure no turn-back of the enforcement to the old status and finally achieve the goal of "practically solving the difficulties in enforcement".